Hi Friends. I am sure you are aware that we have started a new series based on Options Trading Strategies. This series with not only educate you but will also work as a good guide for you when you trade in Options. But in order to learn these strategies, we will first go through some basics of options and terminology used while trading in options. This would be of great help when you start learning the strategies next week onwards. Today, in the third instalment of the series we will understand some important terms which are used while trading in Options. So without wasting more time, let’s start learning them one by one. In the Money Call: We say that the call is In-the-Money, when the strike price of that call is below the market price of the underlying asset. In the Money Put: We say that the Put is In-the-Money when the strike price of the Put is above the market price of the underlying asset. Example: If you buy a call option on XYZ stock with a strike price of Rs. 100, and the current price of the stock is Rs. 120, the option is considered in the money. When we say a call or a put is at the money, it means its strike price is identical to the price of the underlying security. Example: If you buy a call or a put option of XYZ stock with a strick price of Rs. 100 and the current spot price of the stock is also Rs.100, than in this situation, the call or the put will be At-the-Money. Out-Of-The-Money Call: We say that the call is Out-Of-The-Money, when the strike price of that call is higher than the price of the underlying asset. Out-Of-The-Money Put: We say that the put is Out-Of-The-Money, when the strike price of that put is lower than the price of the underlying asset. Example: If you buy a call option on XYZ stock with a strike price of Rs. 100, and the current price of the stock is Rs. 80, the option is considered Out-Of-The-Money. Now this is extremely IMPORTANT. Do pay attention. The intrinsic value of the option is the difference between the underlying’s price and the strike price of the option. The intrinsic value for a call option is equal to the underlying price minus the strike price. For the Put Option, the intrinsic value is equal to the strike price minus the underlying price. 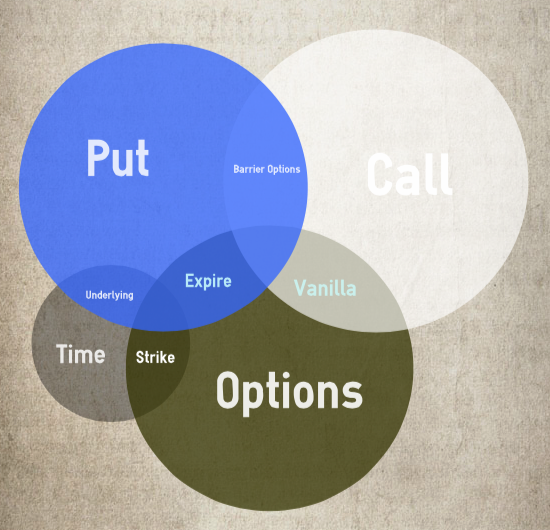 Example : If a call options strike price is Rs. 100 and the underlying stock’s market price is at Rs. 125, then the intrinsic value of the call option is Rs. 25. The premium of a call or a put is dependent on the intrinsic as well as the time value of the option. An option’s Time Value is equal to its premium minus its intrinsic value. Also, The more time that remains until expiration, the greater the time value of the option. That’s because the people are ready to pay a higher premium for more time as the option’s contract will get more time to become profitable compared to less time remaining in the expiry of the contract. Any premium that is in excess of the option’s intrinsic value is referred to as its time value. We hope that your concepts on value calculation of the option and different option types are now clear. Please do not hesitate to ask us questions as it is important to get our basics right before we can understand Option’s strategies. Do keep checking TradeTalk regularly as we will start Option’s Strategies from next week. Till then happy learning friends. Have a lovely weekend.